LIBERAIDER - ARE YOU A ONE OR A HERO? Did you know that the binary system originated from a Boolean principle devised by the striking of a bell? In day of old, German monks would ring a church bell to denote the passage of time or if an event has occurred. In the case of an event, the monks would hit a certain bell to tell the locals that something bad or good was happening. Today though, we don't have a bell, we have a hero instead. 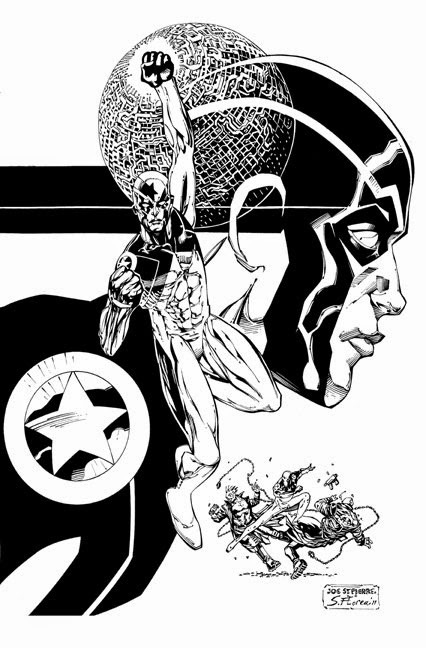 A hero created by my great mate Joe St Pierre. 1) What are your own origins, Joe? Plus what path did you take in life prior to getting to where you are today? I was born and raised in the wilds of upstate New York. I have been creative ever since I can remember; and on one occasion I can recall a kindergarten class where we had to design our own cut-out paper jack o'lanterns. I won first place because mine was the only one that had a beard and mustache. I think that may have been the beginning of the end for me, Ha! 2) How did ‘Liberaider’ come about? It’s ‘secret origin’ so to speak. 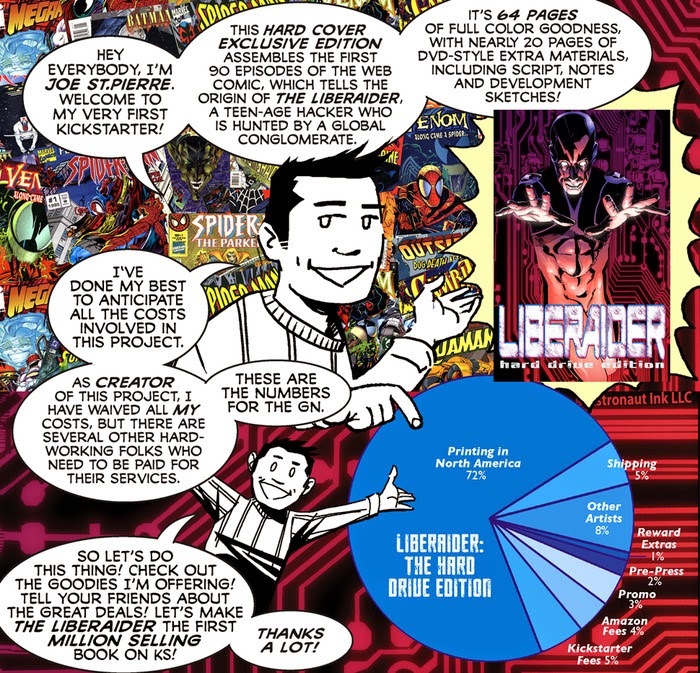 The Liberaider is a kind of amalgam of two of my biggest influences: Silver Age Marvel superheroes like Spider-Man and William Gibson, who was the writer of Neuromancer. Neuromancer was one of the first, if not THE first, cyberpunk stories. It is still a powerfully influential book for me -- very prescient stuff for its time and Gibson's prose is quite great. 3) What song would you say best represents this project and why? Good question! I lean toward the idea that there is no music in the Liberaider's life, at least not at this point in the story. Maybe a sparse Trent Reznor / Hans Zimmer kind of techscape. 4) In your own words how would you describe this story? The Liberaider is a teenage hacktivist -- the Robin Hood of Cyberspace. He infiltrates the database of an oppressive global conglomerate, and discovers some pretty nasty secrets there. 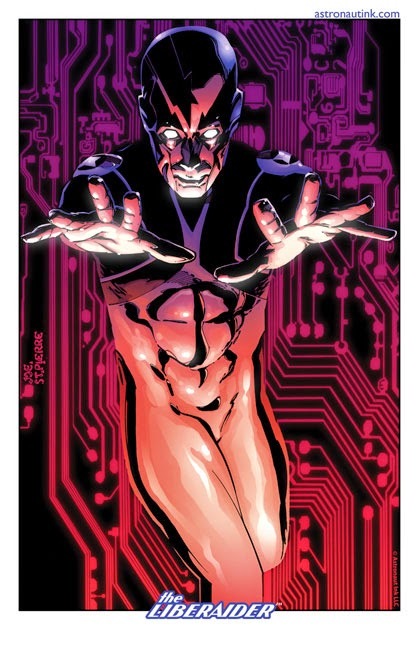 One such secret is a metallic skin that allows him to psychically access C-Space. For this he is (and will be) hunted like a dog by the most wealthy and powerful people in the world. 5) If you could get a celebrity – either living or dead – to promote your wares, who would you choose, and why would you want to choose this particular person? That's a tough one, but I guess I would be looking for someone who can give THE LIBERAIDER: HARD DRIVE EDITION the greatest possible exposure and make it a million seller. 6) What have you learnt about yourself through this endeavour? And were their any unforeseen obstacles you had to contend with along the way? Creatively, it's more a lesson I have to keep re-learning, which is to remember to stay creatively open to the story material, and great things will emerge. As far as Kickstarter is concerned, I think whatever amount of time that you have assigned to a specific aspect of the preparation, TRIPLE it. I have been at this non-stop for a week and it is challenging to keep up! 7) During your time in this field, what is the one thing that has kept you in good stead? The great Joseph Campbell said it best: "Follow your bliss". When you do what you love for a living, you can't lose. 8) If ‘Liberaider’ had a motto, what would it be? I think the main theme of the Liberaider's tale is "Are you a ONE or a ZERO?". So there you have it, dear reader. My mate Joe and his comic book, 'Liberaider'. When you have the time please check out his Kickstater campaign, his website, and his facebook page too. Well, you never know! You might seriously consider being an investor in his great story.